Nestled amongst 8 acres of majestic jarrah and marri trees, Coppin Cottage offers a perfect peaceful holiday getaway. You can't help but relax and enjoy the magnificent wildlife on the property. Registered with "Land for Wildlife", you will share this lovely property with kangaroos, emus, bandicoots and a wonderful assortment of birds. Just 10 minutes from Margaret River township and award winning wineries Leeuwin Estate, Voyager Estate, Xanadu and Redgate, as your neighbours, you will be spoilt for choice. Stunning Redgate Beach is just 5 minutes down the road for great surf, fishing and the Cape to Cape Walk Trail. The property has been beautifully renovated recently, it can accommodate up to 6 guests. There are three spacious bedrooms, two with queen beds and the third bedroom has a double bed and double bunks, ideal for the kids, The cottage has lovely timber flooring throughout. The sweeping verandahs allow you to take in the tranquility of the setting. It has a brand new kitchen with all the modern appliances. The open plan living/dining area features an 8 seater dining table, keep warm and cosy with a wood stove and there's plenty of room for relaxing on the deck overlooking the beautiful bush. Whether you are wanting to snuggle up by the large indoor fire or sip wine on the deck, Coppin Cottage has it all. Coppin Cottage was lovely-true to the photos. A quite seclusion in the bush-very clean and with just about everything you would need for a holiday. We will be going back there ! We had a great stay at Coppin Cottage, the cottage is exceptionally clean with everything provided, the wood heater was just great as it was quite chilly in the evenings, we really enjoyed sitting on the wrap around veranda watching the blue wrens & listening kookaburra's while enjoying a morning coffee or later in the day a glass of wine! The cottage is surrounded by bush and is so peaceful, it was also great that we could bring our dog and she really enjoyed her holiday as well. Would definitely return for another holiday. We had a very enjoyable stay at Coppin Cottage, with everything provided to make us comfortable. 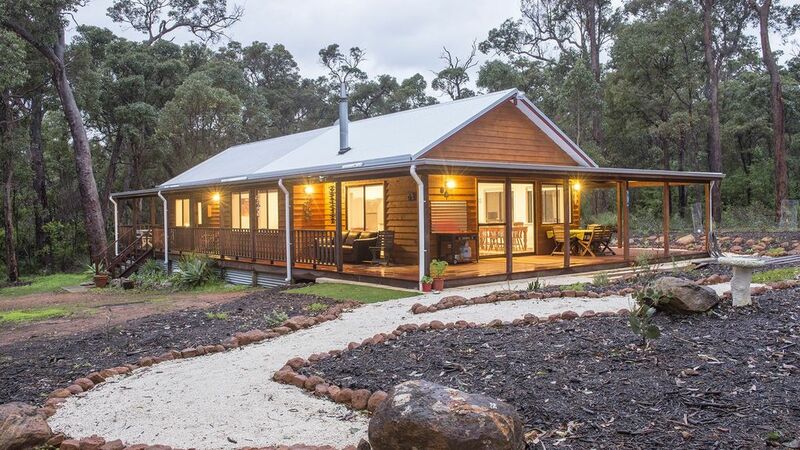 Nestled in the beautiful tall Jarrah/Marri forest of the region with emus and kangaroos visiting the garden, the cottage is modern and sparkling clean with a wood heater that warms the house throughout. Wonderful verandah round the entire house and only a short drive to Margaret River township. Great place - we'll be back ! We found Coppin Cottage to be a quiet and peaceful place surrounded by bushland and would happily return there. It offers a simple, rustic space ideal as a country getaway. My family and I thoroughly enjoyed our stay at this charming and beautifully rustic cottage. The children loved exploring the surrounding woods looking for wildlife while my husband I could sit happily watching them on the tranquil wrap around veranda. The house is set up to be very welcoming and our every need as a family was met. It felt like home away from home and I look forward to visiting again in the future. A very pleasant relaxing stay at Coppin Cottage, allowed us to get away from it all for a few days. A very pleasant relaxing stay at Coppin Cottage, allowed us to get away from it all for a few days. The older cottage is set in a secluded patch of native forest with the rap-around veranda (and supplied hammock) being the ideal environment to watch the sun go down or spend the day reading a book. Great that dogs are allowed to stay  our farm dog very much enjoyed being on holiday as well!